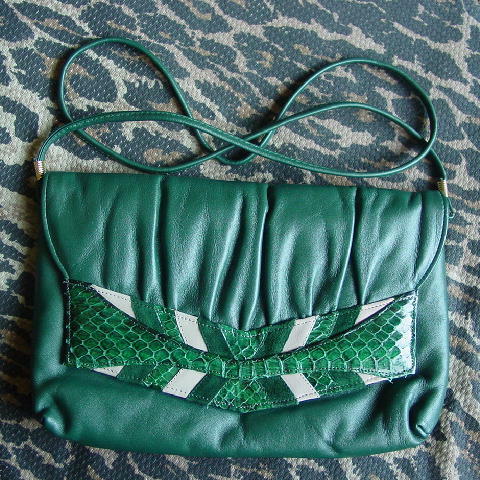 This vintage genuine leather and snakeskin purse is by Jasmin and was made in Hong Kong. It's in a dark teal-forest green with snakeskin in teal green with black accents. 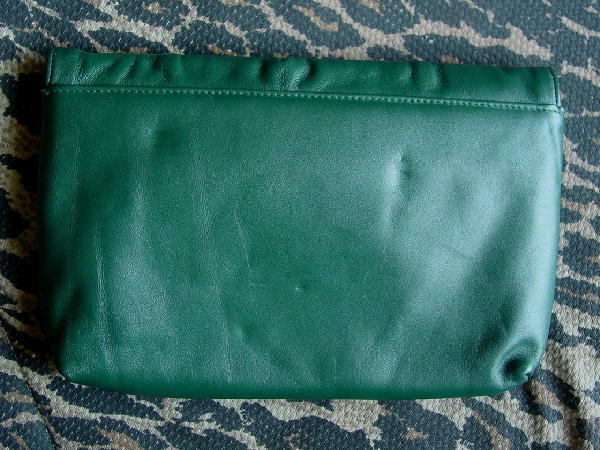 The front panel also has angled dark green suede and dark bone leather accents. It has an envelope styling with gathering and a hidden magnetic snap front closure. There is a detachable 41 1/2" by 1/4" leather shoulder strap. It has a black fabric lining and an interior zippered pocket. The back has a few indentation marks and a clay color vertical line. In person the color is more teal and not so lighter grass green as it appears in the pictures.